Sen. Peter Micciche and Rep. Gabrielle LeDoux. Both trail their primary opponents by razor-thin margins. With the results from all but one of Alaska’s 442 precincts counted there are three legislative races that are too close to call, putting two sitting Republicans at risk of defeat. As of Wednesday afternoon’s vote tally, there are currently three legislative primaries that are separated by fewer than 10 votes. Candidates in those races will have plenty of nail-biting to do over the next week and a half as the state tallies hundreds question, early and absentee ballots in those districts. 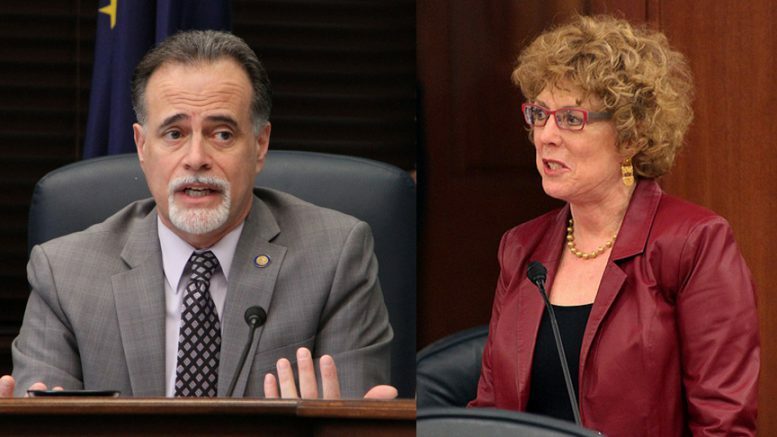 Sen. Peter Micciche, R-Soldotna, trails challenger Ron Gillham by nine votes. Rep. Gabrielle LeDoux, R-Anchorage, trails challenger Aaron Weaver by three. The race to replace Rep. Mike Chenault in House District 29 is also separated by three votes, where Wayne Ogle leads Ben Carpenter. Districts will start counting votes next Tuesday, and the target is to have all absentee and questioned ballots counted by next Friday, Aug. 31 (it has a legal deadline of Sept. 5) and have the election officially certified and set for the general election on Sept. 4 (which is also the deadline for candidates and parties to withdraw and replace candidates). The state sent out 9,834 by-mail ballots and have so far received 5,004. By-mail ballots must be postmarked on or before election day and can be received as late as Friday, Aug. 31. All told, the state currently lists 14,977 absentee, early vote and in-person ballots to be counted. Much of that counting process will begin on Tuesday. House Minority Leader Rep. Charisse Millett officially conceded her primary race to challenger Josh Revak on Wednesday. Millett, who’s served in the Legislature for 10 years, trails by 15.2 percentage points according to the latest tally or 231 votes. The state sent out 261 absentee ballots, of which 118 have been returned and accepted by the state. There are an additional 187 early votes that still have to be counted. The only other sitting legislator who–at this point–will not be heading back to Juneau thanks to Tuesday’s results is Rep. Dan Saddler, who handily lost his bid for the Eagle River senate seat held by the outgoing Sen. Anna MacKinnon. Saddler’s currently down by 16.8 percentage points or 757 votes. There are currently just 736 early and received absentee ballots to be counted (ballots could still come in and questioned ballots could add to this tally). Be the first to comment on "Absentee, question and early votes will decide three too-close-to-call legislative primaries"